Manufacturer of a wide range of products which include harmony mixer grinder. We are instrumental in providing a wide range of Harmony Mixer Grinder, which is available in both standard and customized finishes. These Handy Plus Mixer Grinders are provided with micro balanced rotor to ensure low noise and efficient performance. In addition, the suspended motor rubber boot is also attached to the grinders ensuring vibration free performance along with automatic overload cut– off facility for motor protection. These Handy Plus Mixer Grinders facilitate different usage to make the food full of flavor. 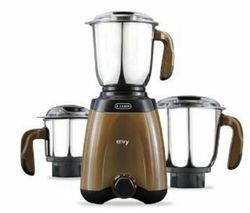 Clients can avail from us this range of Harmony Mixer Grinder at most affordable prices.